The island of Taiwan, formerly known as "Formosa", was mainly inhabited by Taiwanese aborigines until the Dutch settlement during the Age of Discovery in the 17th century, when ethnic Chinese began immigrating to the island. 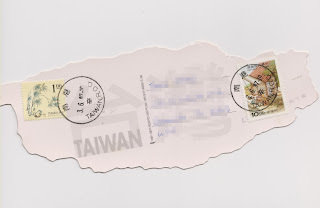 The shaped postcard, showing a historical map of Taiwan around that time, was one of my earliest postcard collections. It was acquired when I was in Taipei to attend a joint conference GIS AM/FM Asia'97 & GeoInformatics'97: Mapping the Future of Asia Pacific. held from May 26 to May 29 in 1997. It was mailed back to the US and had a postmark dated on June 3, 1997.